It wasn’t until last season that Jimmy Butler saw meaningful minutes on a regular basis, so he has yet to truly experience playing alongside Derrick Rose in the backcourt. That is about to change, as Rose, Butler and the Bulls will play the first of eight preseason games Saturday when they visit the Indiana Pacers. And both players, who spent a couple weeks together working out in Los Angeles this past summer, are looking forward to it. Calling fatigue his only problem thus far, Rose said he hopes to simply play his game on Saturday, be aggressive, and continue working towards getting into a rhythm. He admitted it will be also nice to face competition other than his teammates. As for Butler, Rose has been impressed by his versatility and rebounding. He reported that Butler has been knocking down the open shot throughout training camp, something Rose believes is key to preventing the team’s offense from going stagnant. “He’s improved so much,” said Rose of Butler. “He’s playing with a lot more confidence. We’re just trying to get him comfortable so that we’re going to allow him to make mistakes. He deserves to be a starter and he deserves to play through his mistakes. Butler, meanwhile, has enjoyed every minute of sharing the backcourt with Rose. “It’s been fun,” acknowledged Butler. “He makes everything so much easier. When you get out in the open floor, he’s putting the ball in the air for highlight plays and he’s finishing himself. It’s crazy because I’ve never really done it before; I’ve just watched. It’s totally different when you’re out there with him. The extra attention opposing defenses will certainly give to Rose, a magnet for double teams particularly in the postseason, could create more opportunities for Butler to get clean looks at the basket. 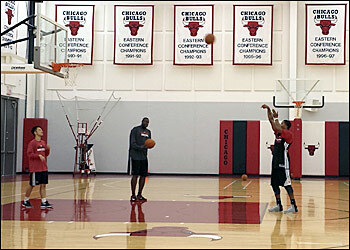 “It sounds easy, but you’ve still got to knock down the shot,” said Butler. Rose’s long awaited return to action gets closer by the day. And while he himself is excited for that moment, so are his teammates. Tom Thibodeau said that Kirk Hinrich and Joakim Noah sat out Wednesday’s session due to “overall soreness.” But neither player is expected to miss any additional time. The Bulls announced that the team waived Patrick Christopher and Kalin Lucas, leaving the roster at 16 players.